With the release of Red Thunder the Soviets have been issued their third artillery unit with the 2S3 Acacia. 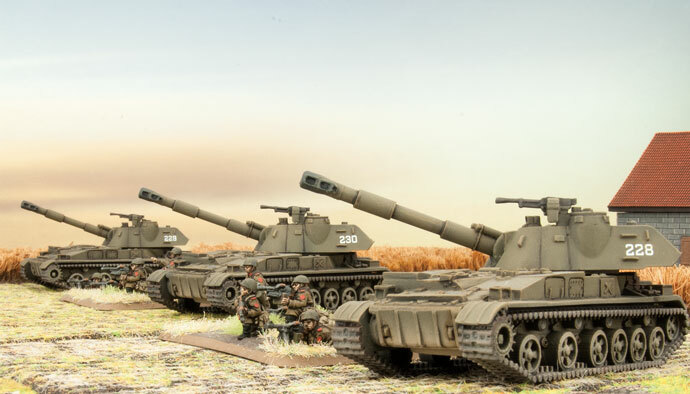 While at first glance the artillery units may seem similar, they like the Soviet units they represent on the table fill different roles in a Soviet force and can compliment forces in very different ways. The easiest way to look at the three units is in the general roles they play, assault gun, area denial and rear guard. Each of these units can deliver different effects on the table so it is important to understand their role, and differences when picking your artillery support as a Soviet player. The 2S1 is the classic assault gun. Designed to follow BMPs into combat and provide both artillery and direct fire support, it rides into battle on the heels of the Motor Rifle Battalion. In game terms it has almost the exact mobility of the BMP-2, and with amphibious and a 3+ cross value the 2S1 can quickly reposition on the battlefield and switch its role from artillery to direct fire support. With Anti-tank 21 this hits as hard as a T-72M, but its slow firing gun makes hitting on the move less reliable so repositioning to a direct fire position after a turn or two of providing artillery support is often what makes this unit successful. The 2S1 is a great unit to start on the table and provide mobility protection to the rest of the force firing smoke in the first turn to enable your MRB or Tanks to make it up table without too much return fire. They can then use the next turn to rush forward in support, using their great mobility to put them in a position to threaten the enemy in the following turn. Don't forget to use orders when doing this as Follow me can be pivotal in setting up the perfect firebase. Even if you don't plan on using it as artillery the 2S1 provides you with cheap AT 21, with Brutal to take on dug in positions or enemy tanks and can really surprise an opponent who doesn't expect them to be charging forward. The BM-21 Grad or Hail is a really interesting unit and can do great things on the table. The Hail fires a salvo template, or for those math magicians out there 4 regular artillery templates centered on the aiming point. The Grad may lack the AT punch of the 2S1 or the 2S3, but its AT 3 will be a threat to light armoured and unarmoured vehicles and will scare infantry commanders. 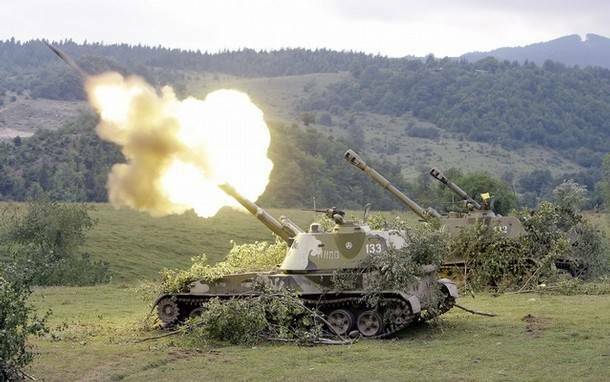 Now while it can be hard for Soviet artillery to switch targets at times, once on target the BM-21 can make it rain. This is where it as an area denial weapon comes into play. The Salvo template can block off or at the very least make routes concerning for the enemy. By placing pre-planned artillery targets in cuttoff positions rather than on objectives a Soviet player can really limit the enemies ability to respond to a changing situation. This allows a Soviet commander to break up the battlefield and push one objective while denying support from the other. Remember the BM-21 can also supply a smoke bombardment once per game and this can be vital to isolate defenders and enable Soviet forces to get to the target or limit reserve unit fire. The 2S3 Acacia is the big boy of the Divisional artillery group supporting a Soviet commander. At a glance many confuse the 2S3 with the 2S1, thinking it is just another gun, this couldn't be further from the truth. The 2S3 differs highly in capability and function from the 2S1, and understanding this is the key to success. Like the 2S1 the 2S3 can fire a smoke bombardment and this should always be remembered as its ability to protect your units is invaluable and will help you get your forces across the table. The S23 has a lower cross value at 4+, lacks amphibious and doesn't have an anti tank round so only has a direct fire Anti-tank value of 14. But while it may lack a little mobility and isn't a direct fire threat to main battle tanks the 2S3 has a toolbox of its own. First and foremost the 2S3 has a machine gun, yup the big artillery gun has a machine gun, and that is huge. As a backfield support piece the 2S3 can hold off infantry and unarmored vehicles with the machine gun which also gives you some albeit light anti air defense. The 152mm round the 2S3 fires has a firepower of 2+ which helps ensure that it kills what it hits, and that is no small matter as even against main battle tanks like the Abrams or Leopard 2 which you can reliably bail or even destroy with artillery strikes. But the beauty of the 2S3 is the Krasnapol round. Krasnapol is a high explosive fragmentation round, it's a huge pipe bomb that you can drop directly on top of an enemy unit. The Krasnapol is a laser guided munition like the Copperhead, so it requires a BMP-1 OP spotting to fire and allows each team to fire as if direct against a target unit. That being said, unlike the Copperhead it has a low anti tank value at only 4, but this is against top armour. 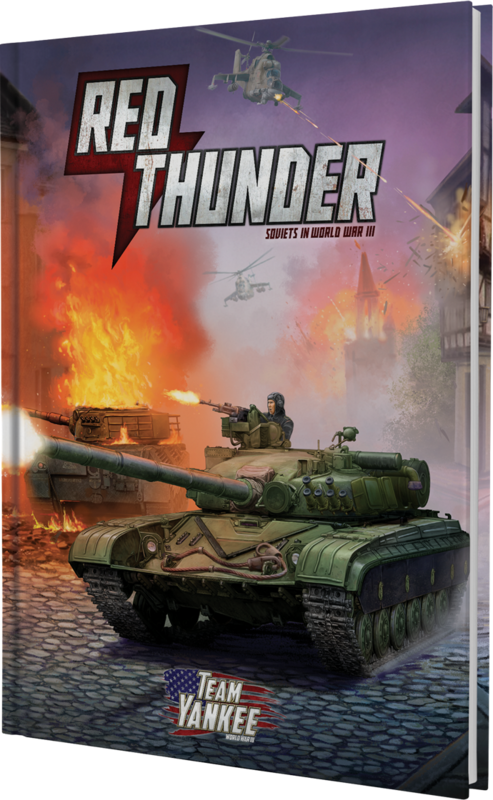 With a 1+ firepower and brutal it will hammer enemy positions hard, either killing units or forcing them to cease firing and go to ground to save themselves, either way this buys Soviet forces time and space to maneuverer and bring even more fire to bear. So with three distinct artillery units a Soviet commander has a lot of options in how to support their attack. With one, two or even three different types of artillery units on the table at a time Soviet commanders can really control where and how a battle will be fought. Smoke is the biggest asset that Soviet forces have to mitigate their 3+ to hit as it can entirely block large amounts of fire if only for one turn. Keeping your units alive as they cross the table is key to bringing the force to bear on a position, smoke gets you into the knife fight. All a Motor Rifle commander wants is to be able to get to the enemy with enough of his men to win and smoke does that. In short Artillery isn't there to kill the enemy, it's there to assist your other units to kill the enemy. Picking and placing your pre-planned artillery targets, not having to range in can makes your strike much more effective and guarantee smoke bombardments. Remember to place them, during set up and make sure that they can do what you want them to, ie lay a smoke, bombardment to close off an alley or hammer an objective. Use smoke bombardments to cut off enemy fire and allow Soviet forces to quickly cross the table and get into the “knife fight”. First turn smoke bombardments are key to crossing the table, but keeping a smoke bombardment from a second unit until a later turn can completely negate fire from reserve or other counterattacking units. Know what role your artillery is there to play and maximize their potential. If they can't support with artillery fire look to move to a better position, fire on another target, or attempt to range in on a cutoff position for later use.